Whether your day is crazy busy or you just don't feel like putting a big meal together, you can't go wrong with one of these easy baked chicken recipes. The dishes range from uncomplicated entrées with 6 or fewer ingredients to budget-friendly crispy baked chicken thighs and whole legs that take just a few minutes of prep time. Whatever recipe you choose, make sure you cook the chicken thoroughly. The FDA recommends that all poultry be cooked to an internal temperature of 165 F. While the recipes recommend a baking time, different thicknesses of chicken could need a little more or less time. An accurate instant-read thermometer is worth its weight in gold! It's the best way to ensure the chicken is done. Crispy chicken with less than 10 minutes prep time? Yes, it's true! All you have to do is mix the seasonings with olive oil, brush the chicken, and put it in the oven. A savory sour cream gravy completes this chicken perfectly. The chicken bakes to perfection with a few simple seasonings, and the sour cream gravy takes only 5 to 10 minutes of prep time. Use whole chicken legs or use chicken thighs and drumsticks in this delicious baked dish. The exotic curry and coconut milk flavors will have everyone asking for seconds! Hot pepper jelly and stuffing crumbs make up the coating for these tender, juicy oven-fried chicken thighs. A simple coating and a sweet and slightly tart honey sauce flavor these baked drumsticks perfectly. A combination of brown sugar, honey, and lemon juice make up the tasty sauce mixture. These drumettes will quickly become your go-to recipe. Bake the drumettes (or wings) with the simple hot sauce and flour coating and then toss them with the final hot sauce mixture. This one-pan dinner combo includes inexpensive bone-in chicken thighs, Brussels sprouts, and pears. Serve the chicken and vegetables with potatoes or mashed cauliflower. Tender, juicy chicken strips coated with panko, cheddar cheese, and bacon? Yes, please! These tasty chicken breast strips bake to crispy excellence with the most delicious coating. This oven-fried chicken recipe is proof that boneless chicken breasts can, indeed, be tender and flavorful. A simple glaze made with only four ingredients flavors this delicious chicken. Peach preserves, mustard, and vinegar are among the ingredients. Panko crumbs and Parmesan cheese make up the crispy coating for these oven-fried chicken thighs. The tangy honey, mustard, and curry glaze flavors these baked chicken breasts beautifully. Marinate the chicken for an hour or two if you have the time. A seasoned pineapple sauce brightens these baked boneless chicken breasts. The chicken takes about 15 minutes of prep time. This chicken entrée makes a fabulous meal with hot cooked rice, some sliced pineapple, and a salad. This one-dish meal will satisfy the pickiest eaters in your family. The quartered chicken roasts to perfection with potatoes, carrots, and celery. Lots of garlic and a few simple seasonings transform these roasted chicken legs into a delicious main dish. These easy, boneless chicken breasts will become a family favorite. Garlic, Parmesan cheese, parsley, and fine dry bread crumbs make up the simplistic coating. Only five ingredients, plus salt and pepper, make these boneless chicken breasts a snap to prepare and bake. The mushroom and mozzarella cheese topping makes them first-class -- easy enough for an everyday meal and special enough for a dinner party. You might recognize this family favorite recipe. The chicken is baked with a combination of Russian dressing, onion soup mix, and apricot preserves. This 4-ingredient chicken recipe will please even the pickiest family members. You won't believe this crispy chicken came from the oven. The chicken thighs start in the skillet in a small amount of oil -- just enough to crisp the skin. A sweet orange sauce flavors these boneless chicken thighs. The chicken thighs take about five minutes of prep time, leaving you to go about other tasks while they bake. Serve them with hot cooked rice or roasted potatoes. Lime, garlic, and cilantro are the complementary ingredients used to baste this chicken. Use split chicken breasts in this super simple dish. These boneless chicken breasts might seem plain and simple, but the garlic powder and basic seasonings flavor them nicely. Serve them as a main dish or in sandwiches, or slice the chicken breasts and add them to a salad. Of course, you can use a baking dish to roast this chicken, but a cast iron skillet somehow seems to make it taste better. 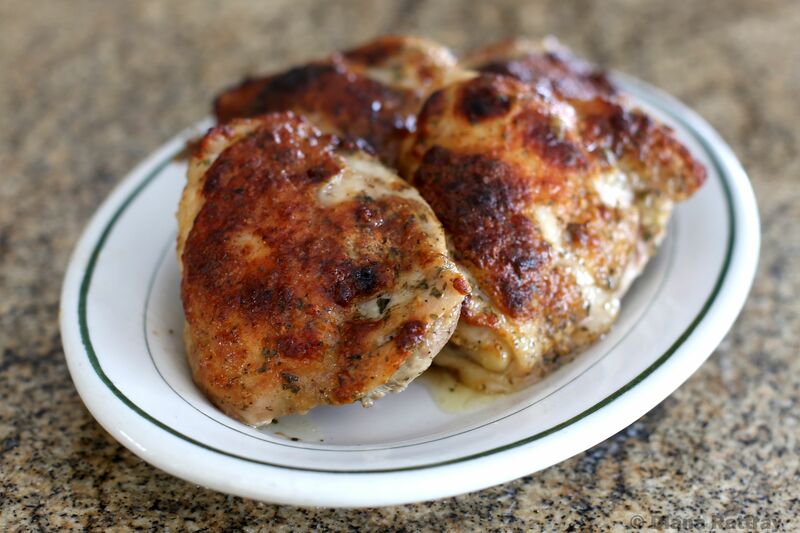 The chicken is perfectly seasoned with olive oil and a variety of herbs and spices. 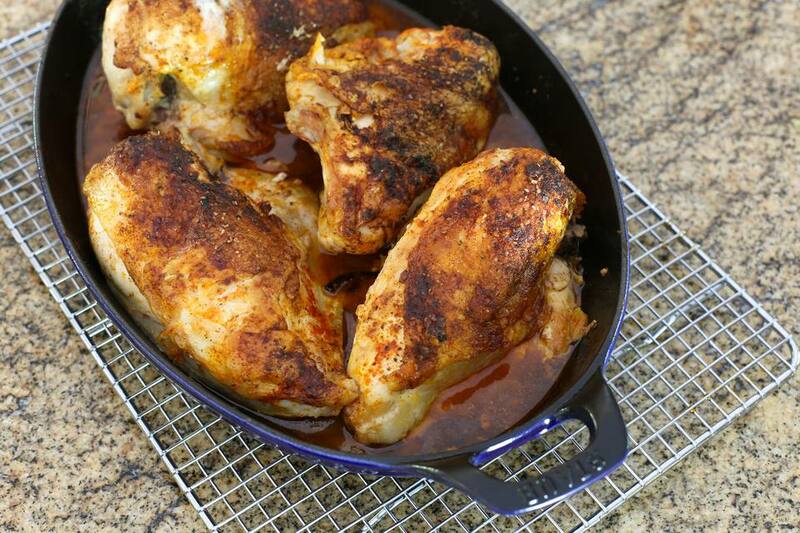 Make this tender, juicy baked chicken with whole chicken legs or chicken thighs. The chicken is basted with a homemade barbecue sauce. An old-fashioned cornflake crumb coating flavors these perfectly baked chicken pieces. Leave the skin on the chicken or remove it to reduce fat and calories.